Davidson Washroom is proud to announce that the Mediclinics Speedflow model hand dryer has been awarded ‘GreenSpec’ approval in the USA and now also qualifies for LEED credits. The perfect solution for projects meeting Green Star and NABERS criteria. 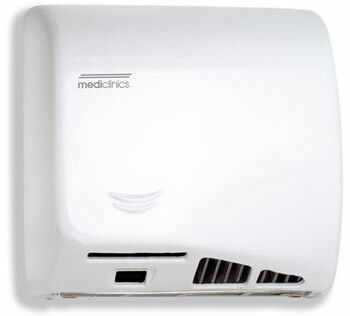 The Mediclinics M06A Speedflow will dry hands in only 10-12 seconds using 1100 watts of power vs. a conventional hand dryer using 2250 watts. Speedflow uses half the energy for half of the time, ensuring lower power bills and significant benefit to the environment. The speed and dry time can also be adjusted to suit any washroom. This attractive, modern design has vandal proof fixings and is available in white epoxy, satin or chrome stainless steel finishes.